I have been on a kick recently that involves reading some works that I should have probably read in my youth. Since I’ve been delving a lot into Ancient Greece and China, this kick has provided me with some lighter reading which I can still count towards my classics list. Despite being Canadian, I don’t generally read a lot of Canadian fiction. There just doesn’t seem to be many classics in this area with the exception of some more modern works, like ‘The Handmaid’s Tale’ by Atwood. 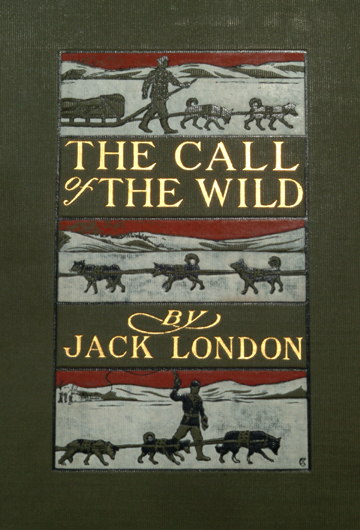 That said, I have always wanted to read ‘The Call of the Wild’ by Jack London. I knew very little about the work prior to reading the short novel; I was under the assumption that it was about a wolf and set in the middle of the Gold Rush (the latter being the only true assumption). In 1897, Jack London at the age of 21 joined the Klondike Gold Rush. I was struck by how cheerful everything seemed in ‘The Call of the Wild’, but later learned that London developed scurvy, lost his front four teeth and had constant pain in his hips and legs. I suppose this serves as a reminder that mom is always right about eating green vegetables. Anyhow, this work was the third published novel by Jack London in 1903, and one of his best known in addition to ‘White Fang’, which was written three years later. ‘The Call of the Wild’ is split into seven chapters and chronicles the life of a dog named ‘Buck’ beginning in the Yukon, Canada in the fall of 1897. Buck is a charismatic mutt, part Saint Bernard and part Scottish Sheppard, who starts his life off as the pet of a wealthy lawyer before being stolen and transported via ship to the Gold Rush where he is sold to Perrault, a courier for the postal service of the Canadian government. He sees something in Buck that he finds special and teaches him how to be part of a sled team (a dog musher). Buck does not get along with the lead dog, Spitz, and the two constantly battle until one day Buck kills him. According to the author, this is a learned response from an episode seen aboard the ‘Narwal’, the ship which took Buck to the Gold Rush [see some of my criticism of London’s writing later on in the review]. Buck becomes the lead dog after the death of Spitz, and the team of dogs works more efficiently than ever before and the dogs are driven to exhaustion by the constant trips given to Perrault by the postal service. After the dogs are used up, they’re sold as part of a secondary market – to a man, his wife and her brother – who know nothing about dog sledding. The dogs continue to suffer and some die in their ‘care’ due to pulling too much weight, lack of rest, lack of food, etc. When Buck refuses to go any more he is beaten until nearly death, and then saved by a man named John Thornton, who is infuriated with the owners. Despite John’s warnings, the group continues to traverse the thinning lake ice in the spring, and the rest of the surviving dogs and the three owners fall through and perish. Buck finally learns what it’s like to love a human being after having endured so much abuse. There is a series of episodes after Buck heals where he saves John in a bar fight and from drowning in river rapids. Buck also makes John a great deal of money on a wager when he is able to pull a 1000lb sleigh by himself. Then we get into the reason why this story is called ‘The Call of the Wild’. John and a few friends set-up camp in an unexplored area of Alaska (or the Yukon? ), and Buck gets antsy about sitting in one place while the group continues to mine gold in the camp. He runs away periodically to the calling of the wilderness, and hunts his own food and has a great time – like a child in a sandbox. He comes back to camp after a long excursion with hunting a large bull moose, to find a catastrophe at camp before eventually making his way back to the wilderness to join a pack of wolves. One problem I have with this work (alluded to above) is that Buck is given many human qualities, as if the author really understands what the dog is thinking and feeling at all times. I suppose this could be interpreted as realistic, but I found many instances where I just felt like it was too much of a stretch. I have no doubt that Jack London knew dogs like this much better than I do, but I had the sense that he would make presumptions that were probably not true to further the story. It reminded me a lot of Mark Haddon’s take on an autistic child in ‘The Curious Incident of the Dog in the Night-Time’. The writing style was very fluid and simple, though I did find some parts laughable in their simplicity and general ignorance. For instance, in chapter seven, London calls man ‘the noblest game of all.’ First of all, I don’t know which definition of nobility that London was thinking of, but my guess is that it was “an exalted moral or mental character” and I found this laughable since humans as a general species were so horribly immoral in their treatment towards Buck. Also, the whole concept of a Gold Rush is based on sheer greed and not a morality quest or love of nature. I enjoyed the book and probably would as a child too. Themes presented included morality, instinct, adventure, necessity, love, death, preparedness, greed and teamwork. If you’re wondering as a parent whether to allow your child to read something like this, like all things, it’s a matter of personal choice. The one caution is that there is a fair amount of violence and death. 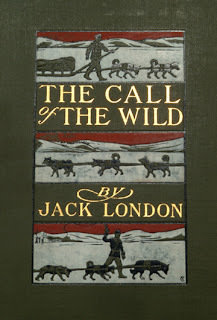 Since I enjoyed this work, I think I’ll try another by Jack London – most likely ‘White Fang’. Have you read either one? What did you think? I can't wait to read this one. Don't own a copy, but it sounds fun! I downloaded this onto my kindle ages ago but have not gotten around to reading it. I thought this book was American though, or am I completely wrong on this! Jess - he's American... I remember seeing the books in all Canadian sections in the bookstores, so now I'm a bit confused. @Jessica - now the reference to man being the 'noblest game of all', makes a little more sense. It seems more like an American sentiment than a Canadian one.